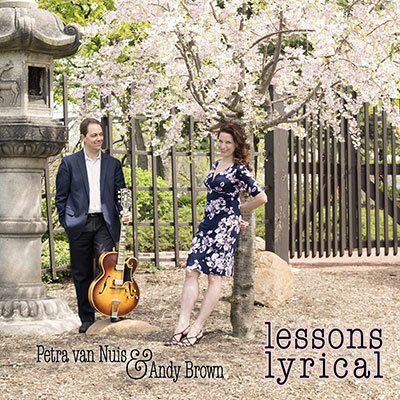 Petra van Nuis (vocal); Andy Brown (guitar). Patti D, La Belle Dame de Whitley Bay Jazz Party, blew in from the Windy City last month with a CD by the Andy Brown Trio waxing eloquent about it before, I guess, she'd even unpacked. Patti knows a good guitar man when she hears one. I listened and reviewed it in glowing terms. 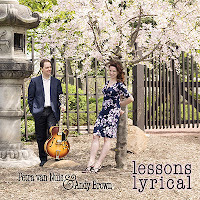 Now Andy himself has sent a CD, this time a duo set with vocalist Petra van Nuis who also happens to be his wife. It began late on Thursday evening with Torstein Kubban, cornet and Phil Rutherford, the north east of England’s finest exponent of the brass bass, joining the Scandinavian Union Rhythm Kings in an annual welcome concert featuring the Norwegians Lars Frank, reeds, Kris Kompen, trombone, and pianist Morten Gunnar Larsen with Sweden’s Jacob Ullberger, guitar and banjo. The festival proper opened at noon on Friday with Spats Langham singing some of Mike Durham’s favourite numbers. The 2017 Mike Durham Classic Jazz Party was well and truly underway! 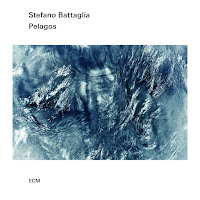 Pelagos: Stefano Battaglia (piano, prepared piano). Provenance: Bjorn Meyer (6 string electric and acoustic bass guitars). Blue Maqams: Anouar Brahem (oud) with Dave Holland (double bass), Jack DeJohnette (drums) and Django Bates (piano). When our leader told me he was going to send the latest ECM releases, I told him there was no need and I'd just send the reviews. I was joking but not entirely. 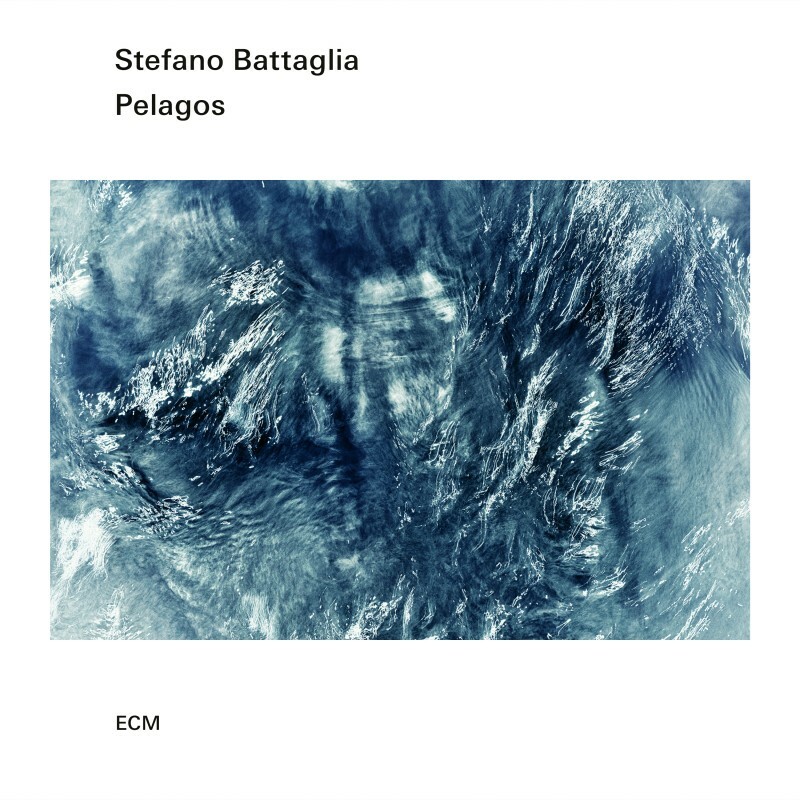 Occasionally an ECM comes through and I can't believe how amazing it is, but generally, it's like listening to paint dry, and it's normally black and white between the two positions, with very little shade or nuance. Unfortunately, there's very little here for the Jazz enthusiast, and I suspect two of them, and maybe all three will appeal only to ECM completists. In fact, I wish they would do them on a special price vinyl record only to reduce the vinyl mountain. Chris Hodgkins has just published three new music business manuals and revised three manuals on his Online Music Business Resource. The three new publications are; Where do you want to be – a business planning manual for jazz music students and musicians. The Guide To Music Organisations – Including Copyright, Royalties and IRCSs. A Quick Guide to Contracts for Jazz Musicians. 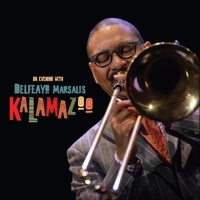 Delfeayo Marsalis (trombone); Ellis Marsalis Jr. (piano); Reginald Veal (bass); Ralph Peterson (drums) + Christian O'Neill Diaz (vocal); Madison George (drums). We don't get many trombone-led quartet CDs for review so when one does come along it's a cause for celebration - particularly when it's as masterly a performance as this. But after all, why shouldn't it be? It involves two members of the Marsalis clan - Ellis Marsalis Junior on piano and one of his younger sons on trombone. Delfeayo incorporates the many facets of his instrument's capabilities. 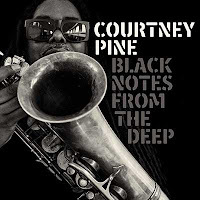 Dirty, down-home blues, growling glissandos and smears interspersed with an almost Dorsey-like smoothness as well as the occasional rapid-fire salvo so beloved of more contemporary players. Delfeayo isn't one to be pigeonholed, he's a man for all seasons - he swings no matter what the tempo. 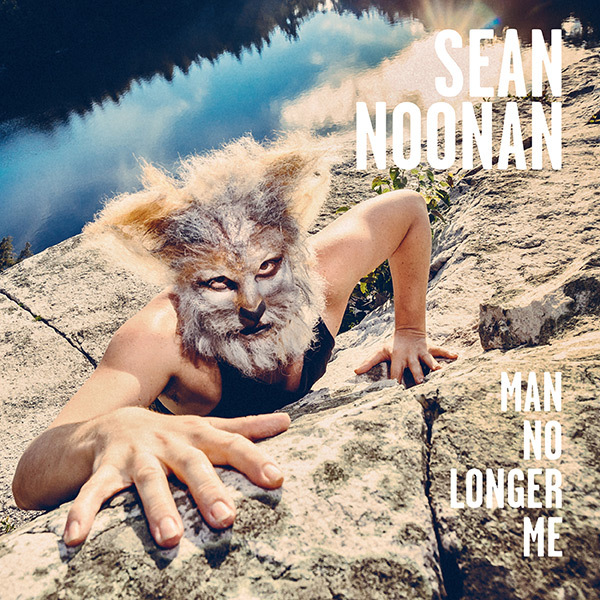 Having seen Sean several times in a jazz-oriented capacity this concept album certainly does not come as shock because even in his live jazz gigs there is always an element of mystical surreal storytelling. 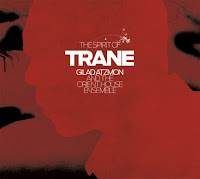 Gilad Atzmon (tenor, soprano, clarinet, bass clarinet, flute); Frank Harrison (piano); Yaron Stavi (bass); Enzo Zirilli (drums) + Sigamos String Quartet. Lots of tributes to the great man during this, the fiftieth anniversary year of his death. But there are constant tributes to him, and when you consider how pervasive his influence has been on the Jazz of the last fifty years and more, perhaps they're just playing Jazz. 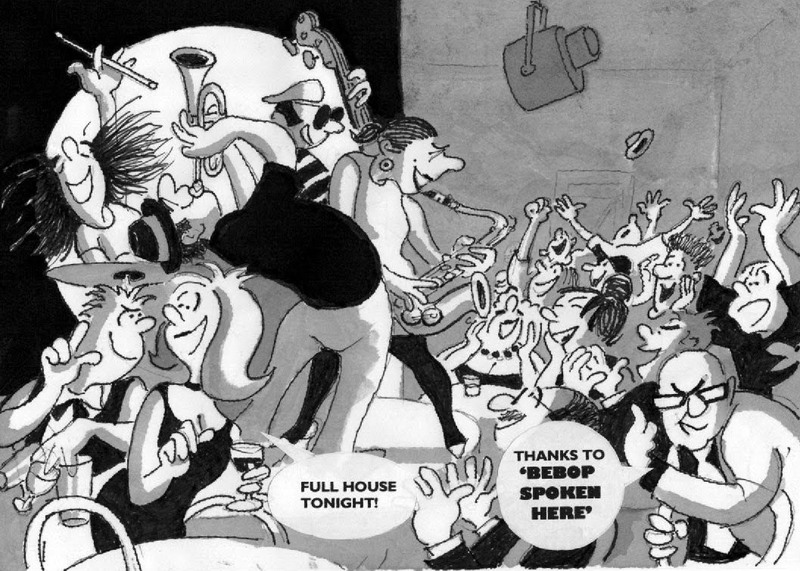 After all, we don't think of everything that happened after bebop as a tribute to Bird. The secret is to do something which enhances or adds to his oeuvre, like the Denys Baptiste album, which focused on the largely neglected late period but risked excluding critics of Late Trane, which is most people. So does this album achieve any of that? Well, yes and no. Abi Lewis' documentary, Geordie Jazzman has its Chicago premiere on November 11 at the Davis Theatre, 4614 North Lincoln Avenue, Chicago Il. The 50-minute film features the late Keith Crombie, the enigmatic face of the old, pre-sanitized, Jazz Café on Pink Lane. Thanks to John Taylor for the info. 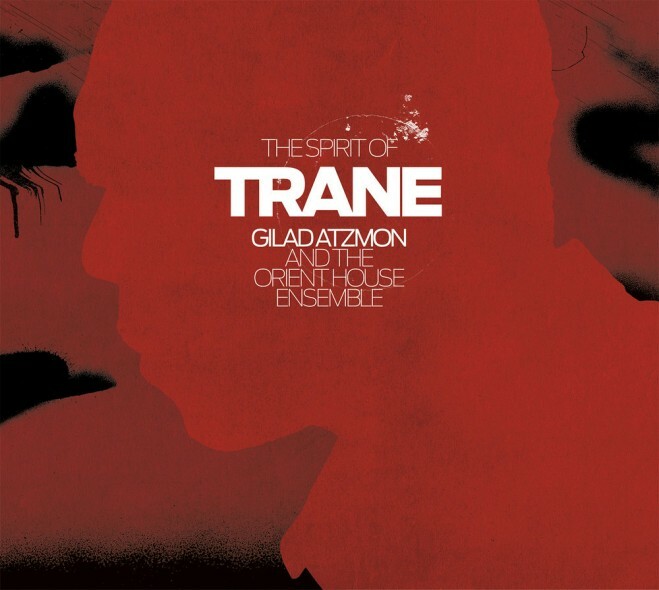 Cécile McLorin Salvant (vocals); Aaron Diehl (piano); Paul Sikivie (bass); Lawrence Leathers (drums); Catalyst String Quartet; Sullivan Fortner (piano). 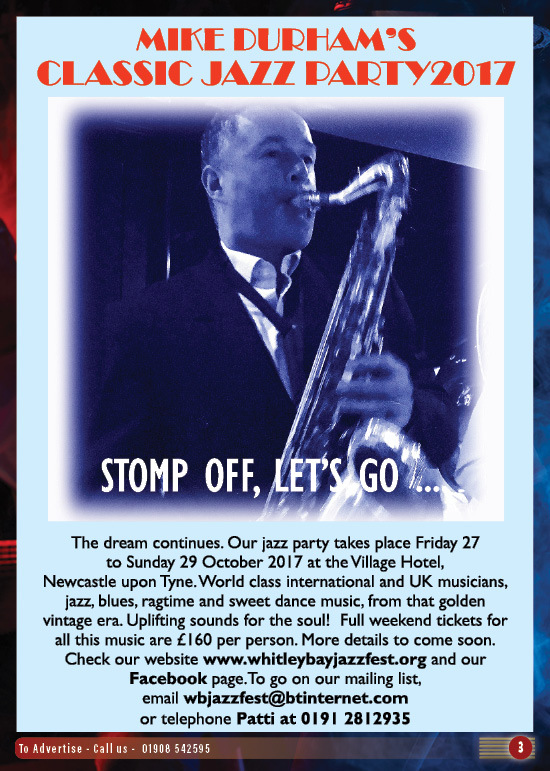 The main jazz action this weekend is at Whitley Bay where the annual Mike Durham's Classic Jazz Party has taken over the Village Hotel. 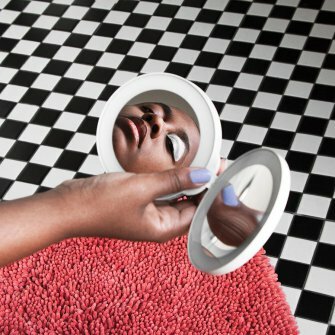 Back in 2010, Cécile McLorin Salvant played to a packed room at the event and every man, woman and child, myself included, fell in love with her. That same year, in New York, she picked up the prestigious Monk Award - her star was in the ascendancy. A couple of more visits to the northeast charted her progress and, on her final visit in 2013, Debra Milne caught up with her. So, given Cécile's links with Whitley Bay, this double CD (or triple LP) came up for review at just the right time. 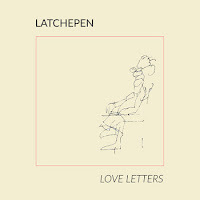 CD Review: Latchepen - Love Letters. Matt Holborn (violin); Kourosh Kanani (guitar); Jérémie Coullon (guitar); Simon Read (bass). Yet another band of 'gypsies' ensuring that the spirit of Django lives and that selling Hot Club music is more rewarding than selling clothes pegs or telling fortunes. Not that these guys are actually of Romani stock although, as Holborn was born in Yorkshire and raised in Scotland, Kanoni is of Irish/Iranian descent and Coullon claims to be the only Frenchman born in Reading it's fair to say their ancestors probably had a bit of gypsy in their soul. As for Read, he's played so many gigs in so many styles that maybe he's as much a gypsy as anyone whose palm has been crossed with silver. 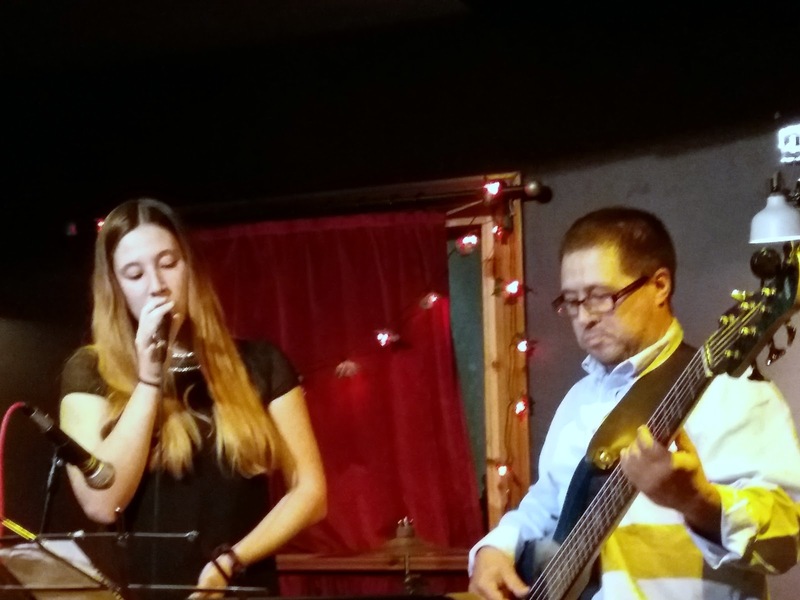 6TEEN54, a one-off quintet comprising BABMUS students, an alumnus, and a visiting bass player from Portugal played to an enthusiastic crowd at the Jazz Café in Newcastle. 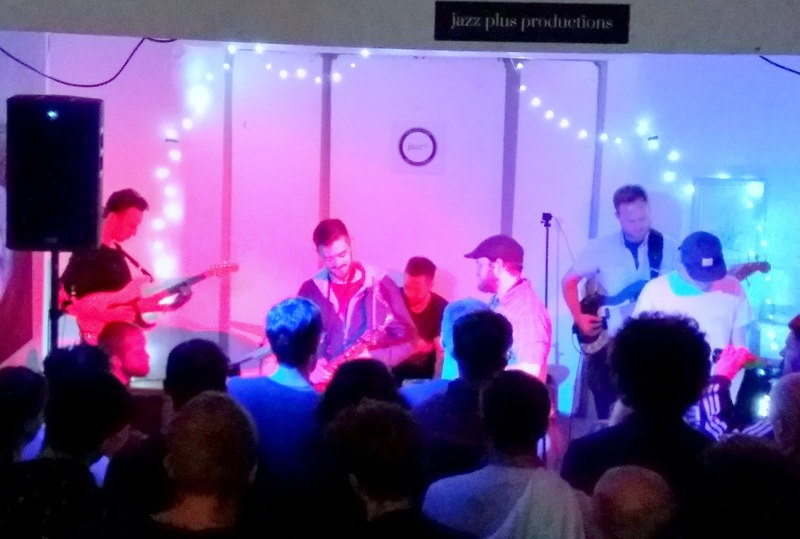 Bearpark (that’s Tom Bearpark and friends) have established a regular Sage Gateshead music students’ gig in the Caff’s upstairs room and it was heartening to see students and friends supporting this one-time-only gig. Kill the fattened calf, the prodigal son has returned! 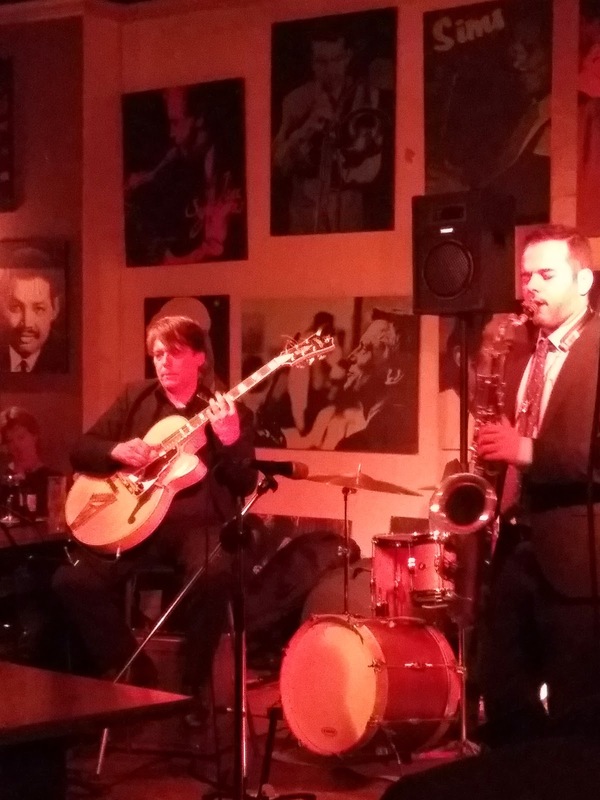 Yes, after ten years in the wilderness squandering his talents on soprano saxophones and bass clarinets, Courtney has returned to his first love, the tenor saxophone. Let jazz fans rejoice and spread the word across the land - Courtney's back and blowing better than ever. Perhaps the bass clarinet years were a form of sabbatical where he sought to rediscover his inner soul before coming to the conclusion that it was time to not just get back into the race, but to win it. Musicians from Europe and America are currently flying into Newcastle International Airport ahead of Mike Durham’s Classic Jazz Party. 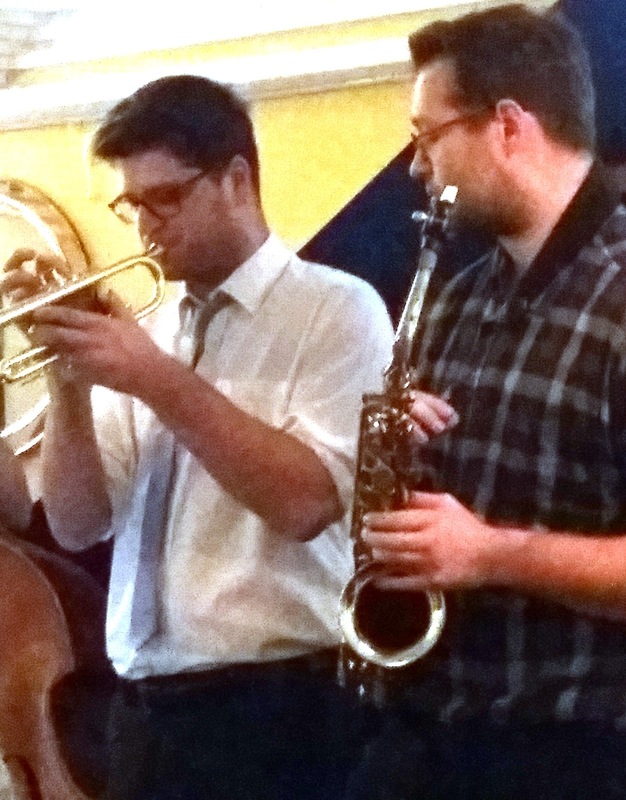 This year’s festival of classic era jazz will be staged as usual at the Village Hotel, North Tyneside with no fewer than nine first time participants joining the many established names at the three-day event. The Classic Jazz Party runs from Friday lunchtime (Oct 27) through to the early hours of Monday. Indeed, some of the early arrivals will be taking part in an opening ‘Welcome Concert’ on Thursday evening at ten o’clock. It’s a marathon event and stamina is an essential requirement to see you through three days of non-stop world-class jazz. Fats Navarro died at age 27. Fats Waller died at 39 and now, yesterday (October 24), Fats Domino defied the odds and survived until he was 89. Like most of his generation who was born in New Orleans, Fats grew up with a background of jazz and blues which he morphed into rhythm 'n' blues providing a link between Louis Jordan and the rock 'n' roll of Elvis, Chuck Berry and others. Trumpeter/arranger Dave Bartholomew played a major part in his success with his infectious backing orchs. Yes it's me and I'm in love again (ba ba ba boom) had no lovin' since you know when (ba ba ba boom) etc. 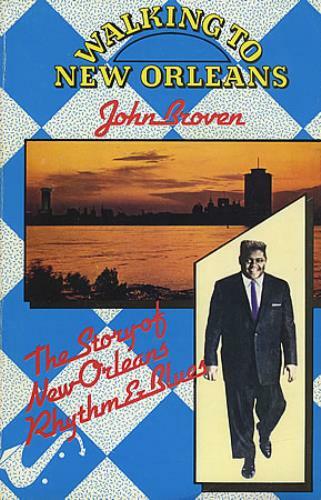 Not surprising that John Broven, in his excellent 1974 book Walking to New Orleans, chose to have Fats' picture on the front. A big influence on so many. Check out Sky Arts tonight - 10pm. The winner of the Jazz Young Musician Award 2017 is pianist Will Barry. 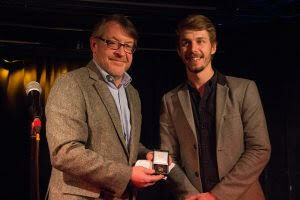 The Master of The Musicians’ Company, Sir Roger Gifford, presented Will with his award at the Pizza Express Jazz Club on 22 October. 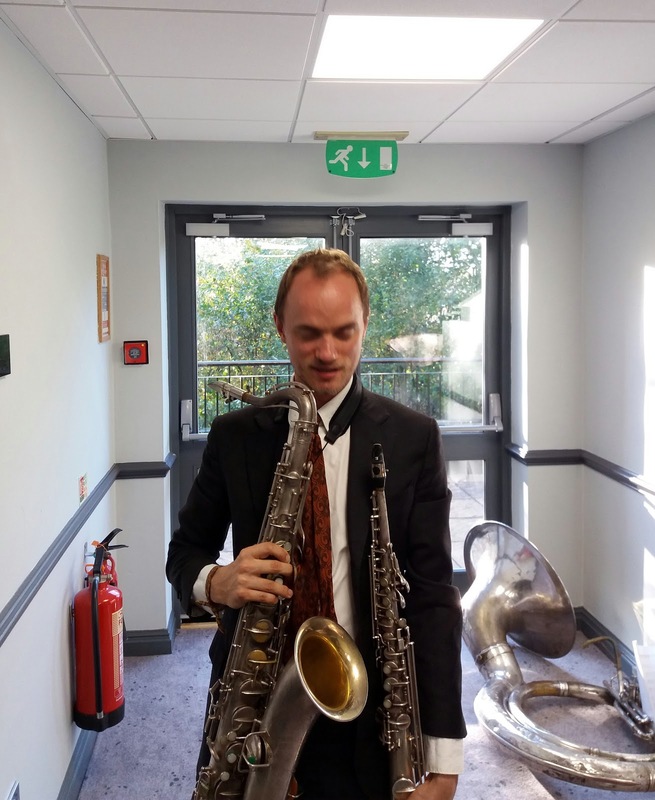 Will Barry performed alongside finalists James Copus trumpet, David Dyson drums, Lluis Mather saxophone, Shirley Tetteh guitar and Tim Thornton bass at the Club, and won the award following a close audience vote. Will joins a distinguished list of past winners including singer Tina May, saxophonists Andy Panayi and Tim Garland, and singer and BBC Radio 3 presenter Emma Smith. Spirit of Light is a celebration in music and song that combines the sacred and the secular in an illuminating new work composed by Tommy Smith. 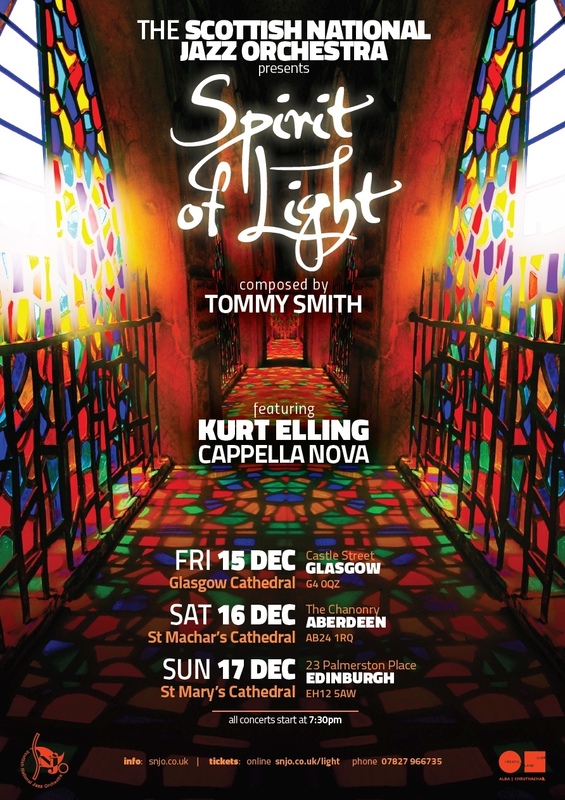 The celebrated jazz vocalist Kurt Elling and the ten voices of Cappella Nova will join the Scottish National Jazz Orchestra to perform this new music inspired by the seasonal iconography of the Star, Three Kings, Christmas Night, Winter Snow and the dawning of Christmas Day, and featuring settings of poetry by eminently humanitarian writers such as Liz Lochhead, Rainer Maria Rilke, Norman MacCaig, Robert Frost, Franz Wright, Jim Heynen, and St. Francis of Assisi. Peter Horsfall (vocals); Giacomo Smith (alto); Joe Webb (piano); Ferg Ireland (bass); Pedro Segundo (drums) + David Archer (guitar) & Cherise Adams-Burnett & Renato Paris (backing vocals) on Couldn't Stop Lovin' You. 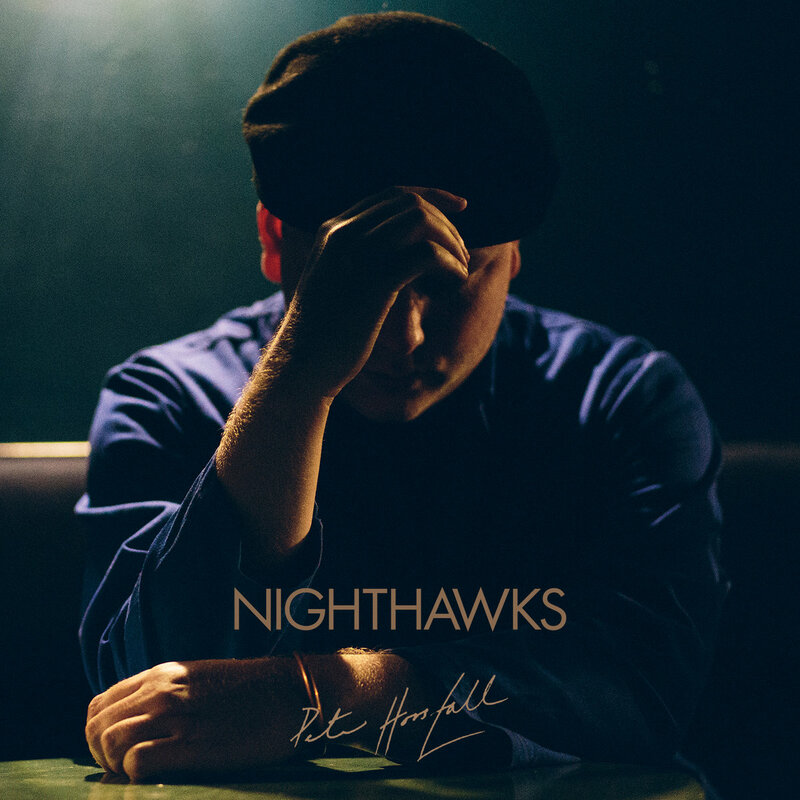 If you're expecting to hear some modern Dixieland horn-blowing from Basin Street Brawlers' trumpet man, Horsfall, then walk away now. However, if you're a fan of his whispering, atmospheric vocals, then, stay right there - don't move. If Edward Hopper is your favourite artist then you won't want to move and, if you just happen to wonder if Cécile McLorin Salvant paints as good as she sings - here is where you find out! Mark Williams (guitar), Paul Susans (bass guitar), Russ Morgan (drums). No doubt, to the disappointment of our fearless editor, my visit to Empty Shop was accompanied by a severe bout of freshers/man flu (which kept me away the previous night), so my review is slight, but I didn't want the occasion to go unmarked. No doubt he'll be thrilled that I've still found a few words to target a couple of things currently causing such enormous harm to music. A slow start by Empty Shop standards but by the interval the chairs were pretty much occupied with almost thirty, including a large group of newbies (no doubt responsible for my ailment), who didn't know the protocol of clapping for each and every solo, and no bad thing either. Described on the Jazz Cafe website as “a twice-monthly platform for young, straight-ahead jazz musicians” hosted by Bearpark, with an implied exclusive concentration on standards, October’s ‘BABMUS Presents’ gig in the venue’s upstairs room on Thursday 19th pretty much up-ended the advance description. For a start, the social media publicity for the event billed it as an early Halloween celebration and sure enough, the arriving crowd was greeted by the sight and the slightly singed odour of traditional pumpkins. Not to be outdone, Pam on the door handed out complementary lollies and came close to running out when no less than 40 people turned up. 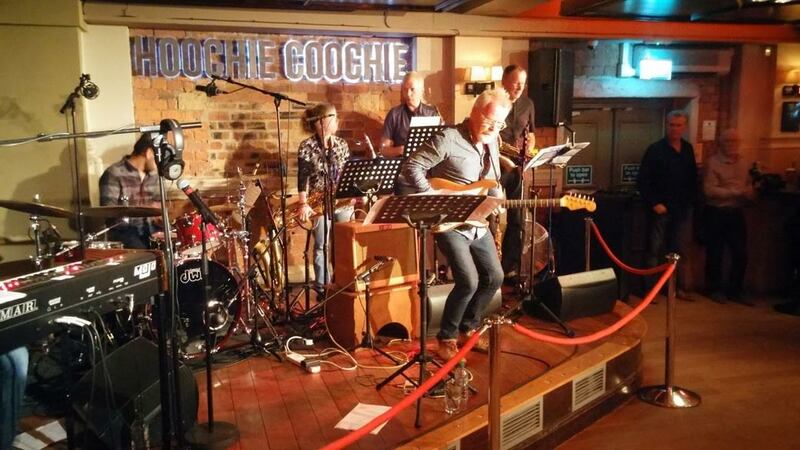 They came from all points – Cumbria, County Durham, Tynedale, and hot foot from a star-studded Big Idea gig at Hoochie Coochie. The Black Bull bulged at the seams…Vasi X was back in town! 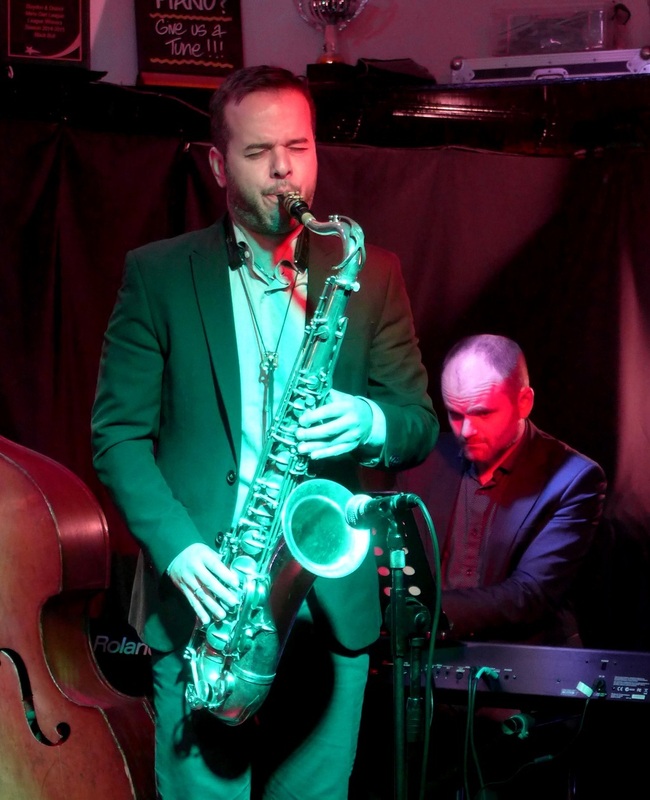 A full house was all but assured thanks to Vasilis Xenopoulos’ hugely successful previous visits, and, long before the advertised start time of eight o’clock, it became clear that this Blaydon Jazz Club gig would indeed attract a capacity audience. Pianist Philip Clouts celebrates his quartet’s tenth anniversary with a 13-date tour that includes a concert at Eyemouth Hippodrome, just eight miles over the border into Scotland, on Saturday, October 28 at 8pm. Clouts formed the quartet – originally a trio – to create a more intimate contrast to the band he’d been working with since the turn of the millennium, the jazz and world-beat ensemble Zubop, which had expanded to a nine-piece through collaborations with Gambian master musicians Juldeh Camara and Njega Sohna. After releasing his trio album, Direction South, he felt that he wanted to add another voice and so Carlos Lopez-Real from the F-IRE Collective joined on saxophone. There are some things frustrate me about Sage Gateshead - the parking is expensive, the beer is overpriced (and keg) and the place has a certain officiousness about it (for example even for informal style gigs they can make you wait outside the auditorium until a number finishes). However, since it always succeeds in its primary objective of putting on world-class musical acts in great spaces with wonderful acoustics all the above can be forgiven. Saturday night was a case in point with this international free jazz super trio. The only false note of the evening came before a quaver had even been sounded when Mat Maneri said ‘how good it was to be back in Newcastle’. ‘It’s Gateshead’ some of the tribal crowd hissed back at him. Gerry (Crumax Keyboard/vocal); STING (guest vocalist); Garry Linsley (alto); Stuart Johnson(tenor); Sue Ferris. (Baritone/flute); Mark Webb (trumpet); Dave Hignett,(trumpet); David Gray. (trombone); Rod Sinclair(guitar) Adam Sinclair (drums). It’s been a while since I’d seen Gerry Richardson’s Big Idea so the Sunday afternoon gig at Hoochie drew my attention. Can’t believe that it was only their second performance at the venue. Considering it was a free gig there wasn’t exactly a full house for the 5pm kick off. It did fill up later on though as a special surprise artist was to perform in the second half. The first set started with Stone Church and Blues for Red followed by Ska Odyssey. Big Jazz Club in the Sky was next - a vocal for Gerry. African Sunset, Right On, The Turnaround Shuffle came next. The set finished with my favourite vocal from Gerry, Lady Day and John Coltrane. 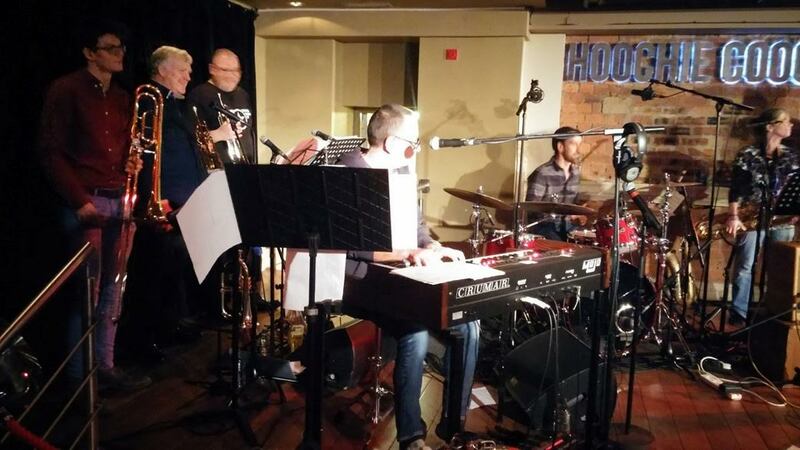 ...that Sting sat in with Gerry Richardson and the Big Idea at Hoochie Coochie this afternoon. Anyone take notes, photos? Check out video by Sophie Snowdon on F/b. 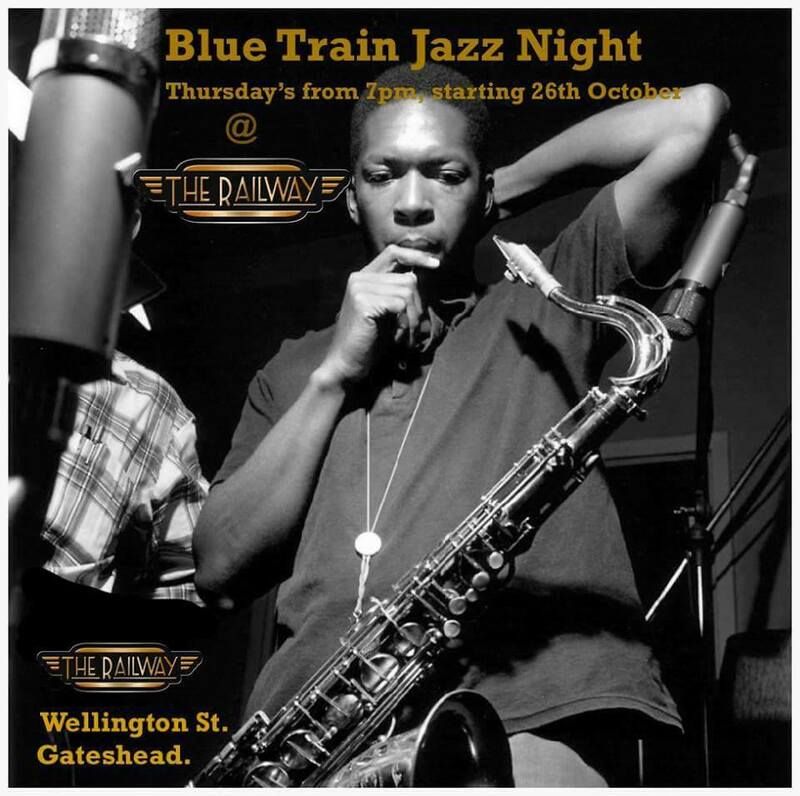 Gateshead Railway Club, which recently started hosting blues nights, is holding a 4 week Thursday night - see how it goes - series of jazz gigs. Organised by David Wares who also hosts a jazz program on Spark FM 107 which, I'm led to believe, recently had Debra Milne/Steve Glendinning playing live on the show and that the duo is scheduled for a follow-up Railway Club appearance. First session is this Thursday - October 26 - and may feature David's own band, Thelonious Punk. 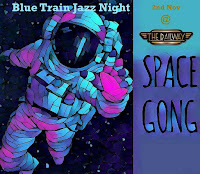 The following week, David Keighley's Space Gong is billed to appear and, as David Wares has yet to book a band for November 9, by a process of elimination, it may well be Debbie and Steve for November 2. Bands interested in playing should contact David via Spark FM. 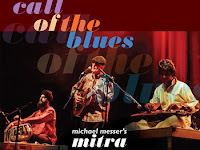 British bluesman Michael Messer has played in numerous line-ups during a thirty plus year career. In 2013 Messer was invited to perform at a festival in Mumbai. It was during his visit he met Manish Pingle. They jammed together and Messer resolved that one day they would perform together on a stage in front of an audience. Messer recruited London-based Gurdain Rayatt and, in September of that year, the trio played a gig at the Troubadour Club in London. Mitra was born. A Friday night in mid-October sees all and sundry heading to the Traveller’s Rest in Cockerton. What’s the occasion? The annual visit of Vasilis Xenopoulos, that’s what! As they queued down the stairs, drinks in hand, a voice said: It’s a tenner tonight. Another replied: I’d pay thirty quid tonight. Such is Vasilis Xenopoulos’ reputation that an increase in the usual admission price didn’t deter the faithful. 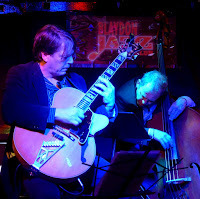 An added attraction at this Darlington Opus 4 Jazz Club gig took the form of the brilliant guitarist Mr Nigel Price. 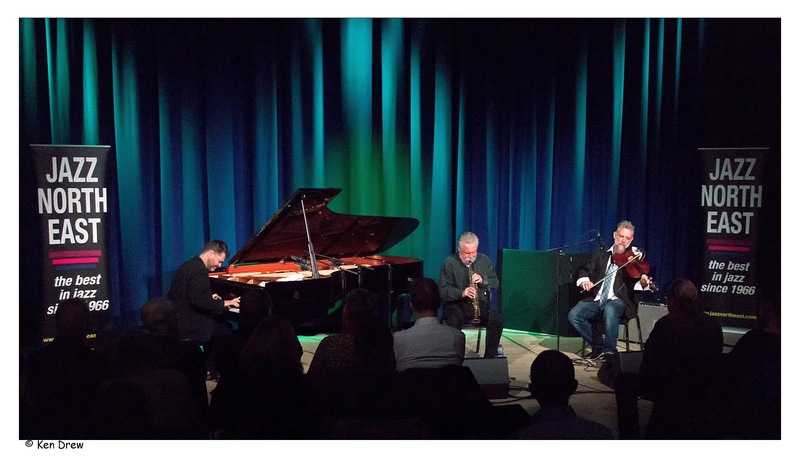 Add in the best piano trio around – Messrs Paul Edis, Paul Susans and Russ Morgan – and it had all the makings of a memorable occasion. 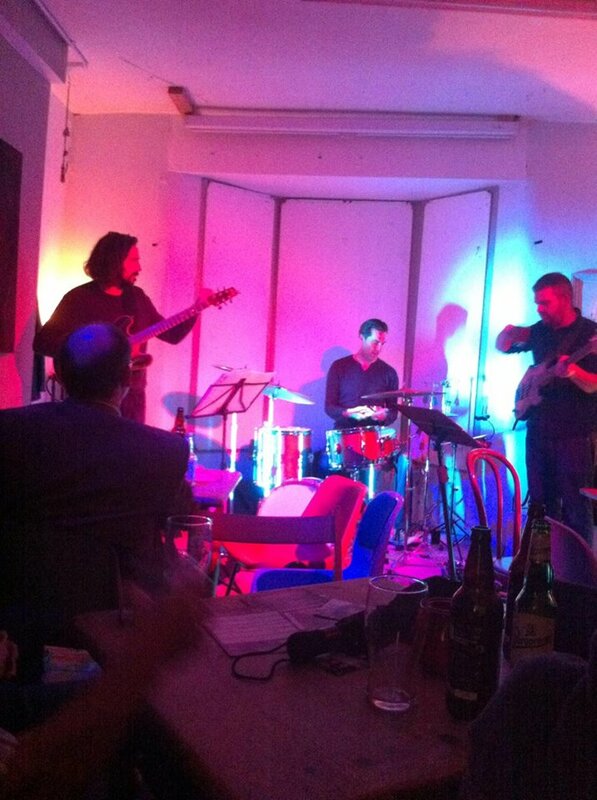 XPQ are Vasilis Xenopoulos, Nigel Price and, on this gig, the aforementioned A-list rhythm section. On June 21st Xenopoulos and Price went into the studio to record material associated with several of the great saxophone/guitar partnerships in jazz history. The album Sidekicks (review to follow) is the result of their endeavours, and here at Opus 4 not only was the physical product (CD) available to buy hot off the press, the evening’s two sets featured cuts from it! Showtime is 8.45pm - tickets are £10 which includes a Pie 'n' Pea Supper. Vasilis Xenopoulos stepped off the train at Central Station and walked all of two minutes to the Lit and Phil. This was to be the first of two gigs in a day for London-based Xenopoulos. This reunion with friend pianist Paul Edis found the duo surrounded by audio-visual recording equipment. Their excellent 2016 album A Narrow Escape deserves to be heard by a wider audience and promoting the ‘product’ to interested parties won’t do any harm at all. 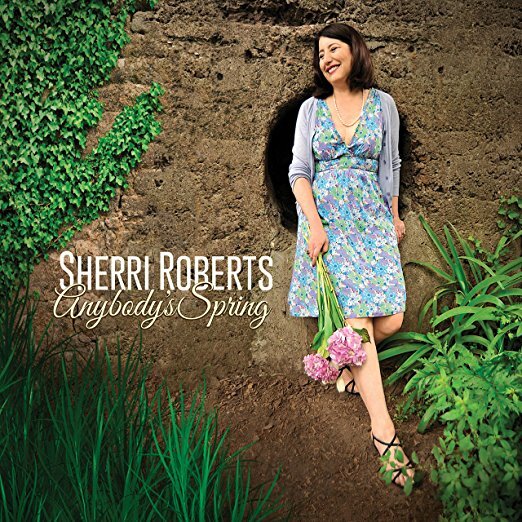 Sherri Roberts (vocal); David Udolf (piano); Harvie S (bass); Akira Tana (drums); Sheryl Bailey (guitar). The seasons have provided fertile material for songwriters, often to the point of overkill with: Winter Wonderland, Autumn Leaves and Summertime being typical examples of good songs that have been flogged to death unlike Winter in Madrid (Ann Richards w. Kenton), Autumn Serenade and The Things We Did Last Summer which are all worthy of more exposure. 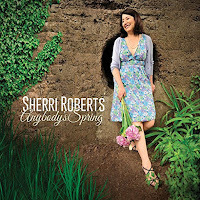 Spring, however, is a different kettle of fish - possibly because there are more of them [songs] - but, since Shakespeare's It Was a Lover and His Lass, Spring, like love, has ever been in the air and the airs on this album are 12 of the best sung by a lady who moved from theatre to song when she recognized that exploring the rich emotional life of a character through story can be done far more economically in a four-minute song than a two-hour play; that a well-written song is like a drama in miniature, distilled to its musical essence; and that singing, like acting, offers the means to externalize the deeper, internal self. She walked away from theatre and onto the bandstand, and hasn’t looked back since. And I'm rather glad about that! The ever-popular saxman Vasilis Xenopoulos began his barnstorming tour of the northeast this lunchtime in tandem with pianist Paul Edis at the Lit and Phil in Newcastle. Tonight, the duo, augmented with top UK guitarist Nigel Price, Paul Susans on bass and Russ Morgan on drums, play the Opus 4 Club in Darlington. Tomorrow night, sans Edis, they play Eyemouth and come Sunday they're at Blaydon Jazz Club - Mick Shoulder plays bass on this one. Russell will be reporting all of the gigs apart from Eyemouth (passport expired) so watch this space. Jerry was at today's lunchtime session and sent these photos as a taster to the Lit and Phil review. 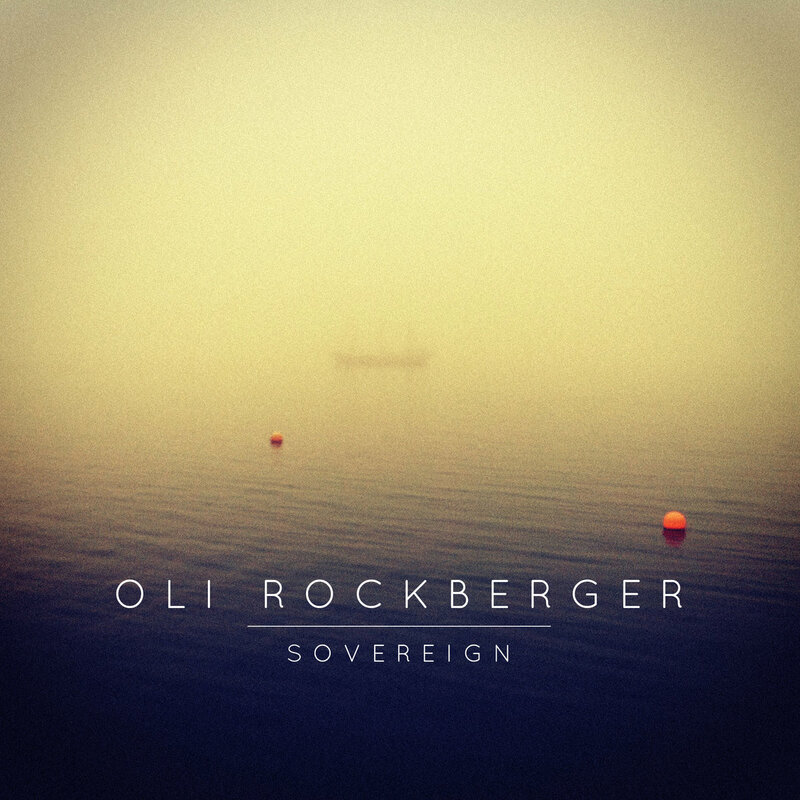 Pianist, vocalist, songwriter and producer Oli Rockberger’s fourth studio release, Sovereign (his first for the Whirlwind label and following on from his self-release Old Habits), takes its title from the viewpoints of transition, growth and independence. 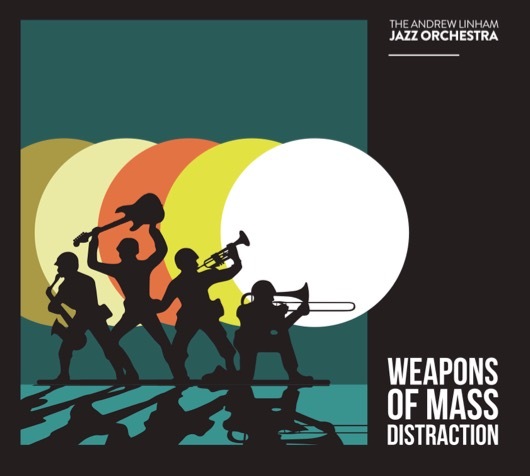 The music for this album came together from a decision to return to his native London after sixteen years in the United States where, following successful graduation from Berklee College of Music attended as a Full Tuition Scholarship recipient, his hugely formative New York career developed as sideman to big-name jazz instrumentalists including Randy Brecker, Will Lee (with Steve Gadd) and Nathan East, to working alongside acclaimed singer-songwriters Carly Simon, Jesse Harris and John Mayer. 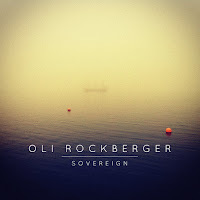 Now based in the UK capital, Rockberger continues to work internationally as an in-demand sideman, with recent collaborations including Becca Stevens, Richard Spaven, Fridolijn and Louis Cole, in addition to his ongoing work with acclaimed UK songstress Laura Mvula, as a member of her touring band (keys/vocals). Dance the Story is one of the tunes on Manchester-based Glowrogues’ debut download album Live at Jazz Plus Presents. The seven-piece band is touring its new ‘product’ on a word-of-mouth, social media whirlwind tour, and, at Durham’s Empty Shop, band and audience danced the night away. At this gig Glowrogues’ record label had a very local connection. 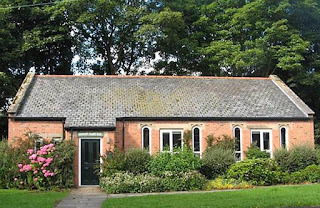 Founders Charles and Chris knew all about the venue having recently graduated from Durham University. Now London-based, their Jazz Plus Presents business partnership inked in a Durham date on Glowrogues’ autumn tour. 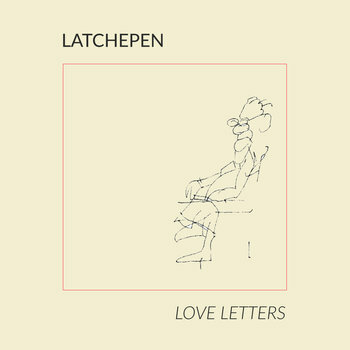 (The press release says as much, and more, about this album than I could ever come up with. Nevertheless, I go along with every word. Daniels has long been my favourite modern clarinet player of the post-De Franco era and, unlike the clarinet men who preceded him, he was one mighty tenor player too. However, its clarinet all the way here and an object lesson for anyone who thinks that modern clarinet, played with technique is passé. Maybe it is as these tracks were recorded in 1988! – Lance). Guitarist Ron Hampton of Tees Hot Club fame has asked me to mention a trad gig coming up in Leyburn, North Yorkshire. The Frisco Bay Hot Stompers are crossing the Pennines to play the Bolton Arms Hotel in Leyburn, North Yorkshire which is interesting for a few reasons. The personnel includes Tom Derbyshire on bass (pictured) who, many years ago, was part of the Jim Vincent Trio with the late Marshall Walker on drums. 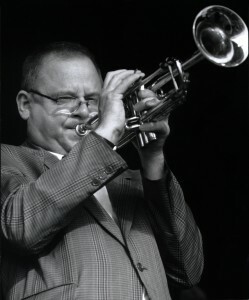 He also, I believe, played in a college band with the late Bill Shaw. I also did a gig with him many many years ago - too long ago to remember. The last time I saw Tom was either at Marshall's funeral or when he did a dep gig with the Maine Street Jazzmen at Rosie's in South Shields. So much for the reminiscences! The Jazz Café’s jam session is rapidly approaching legendary status. The Pink Lane venue across the road from Newcastle Central Station is the place to be at eight o’clock (earlier if you want to sit down as seats are at a premium) every first and third Tuesday in the month. The house band is an A-list affair and the many sitters-in invariably bring their A-game to the party. This October 17 renewal attracted a dizzying list of participants. The house trio – James Harrison foregoing the Caff’s upright piano in favour of his own keyboard, Paul Grainger on double bass and drummer Russ Morgan – set off on the right track with Yardbird Suite. 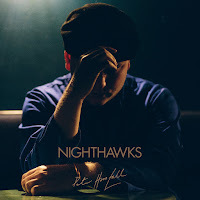 Harrison likes to keep things moving (ideal at a jam session) and Mambo Inn did just that featuring a Russ Morgan solo followed by Harrison’s accomplished intro to everyone’s favourite tune – Secret Love. 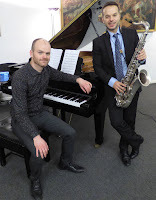 This last-minute addition to the programme features a quintet including Thomas Dixon (saxophones) and Jamie Jingles (guitar) from our monthly resident band ‘Bearpark,’ Inês Gonçalves (piano) from the Sage Gateshead jazz degree course, Ben Fitzgerald (drums) and José Gonçalves (electric bass), a special star guest from Portugal, the father of the band’s pianist making a flying visit to the city. José Gonçalves founded the RIFF school of jazz at Aveiro whose students won 1st place at the prestigious São Luiz Jazz festival. As a musician, he performs on both electric and double bass in a number of genres with artists including Oscar Graça, Alexandre Coelho, Fernando Rodrigues, José Martinho and many others. 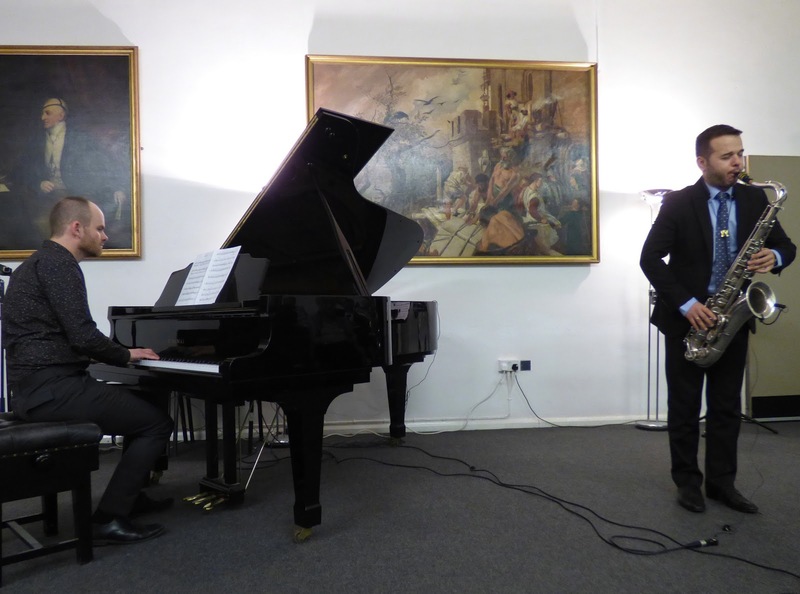 The band will be performing an array of fresh original tunes by José Gonçalves, Thomas Dixon and Inês Gonçalves and some modern interpretations of standards. 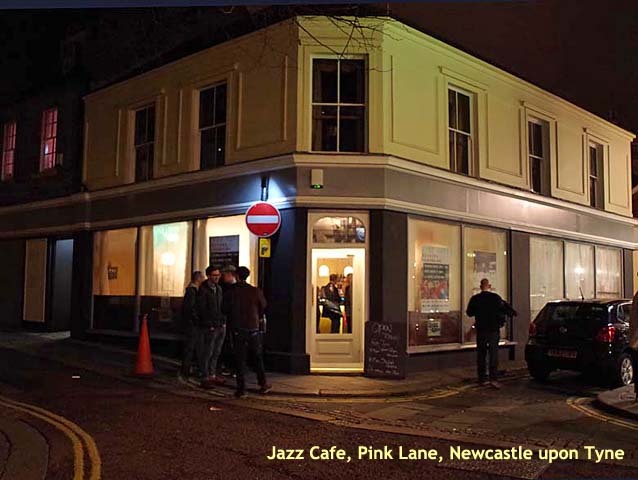 Jazz Café, 25 Pink Lane, Newcastle NE1 5DW. October 26, 8pm. £3. 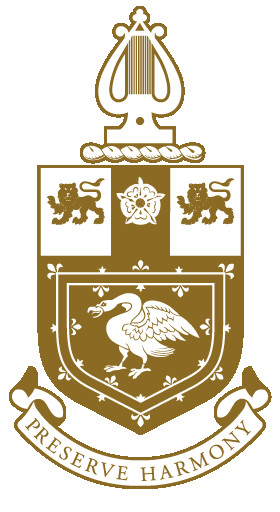 (We rarely publicise events out of the area but, when it involves the NJA - an organisation we hold dear - we sometimes make an exception as is the case here. Award-winning drummer Clark Tracey is bringing his quartet to play a fundraising concert for the National Jazz Archive on 24 November in Walthamstow, North East London, an event worth supporting for those of our readers within stomping distance of the venue so, without apology, the press release is below - Lance). To celebrate what would have been Stan Tracey’s 90th year, Clark Tracey has written the definitive biography of his father (The Godfather of British Jazz), being published by Equinox Publishing. 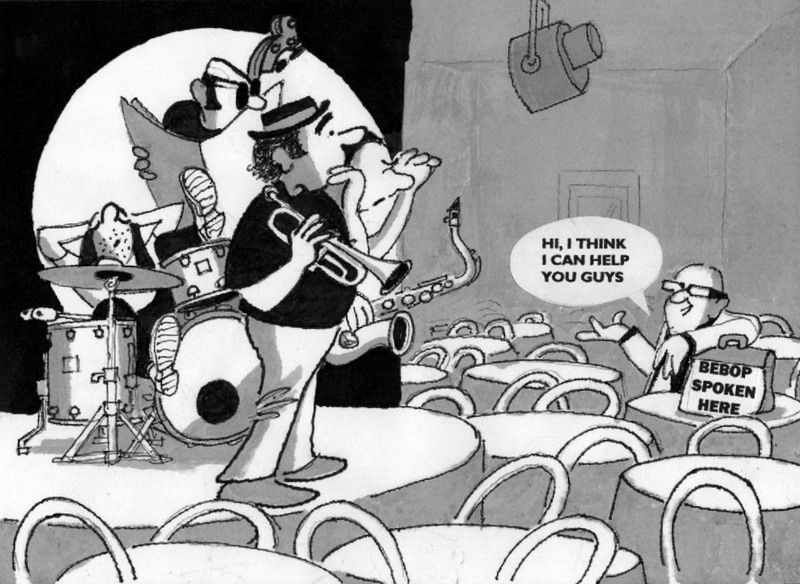 The concert will be part of the book’s launch and will feature Stan’s music and well-known jazz standards. Stan was an important British jazz pianist and composer whose distinguished career spanned six decades. 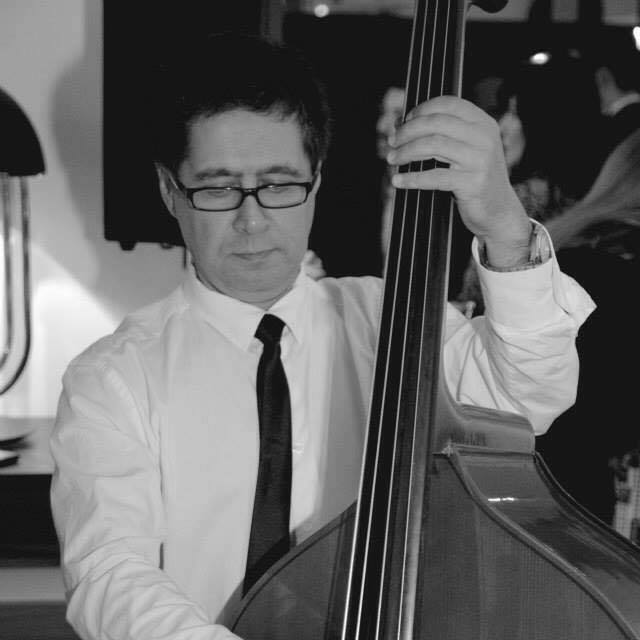 Clark Tracey is one of the UK's premier jazz men with an international career as an outstanding composer, arranger and drummer. He has won Best Drummer in various awards five times, including the British Jazz Awards in 2016 and 2017. Preview: This Sunday at Hoochie Coochie. The occasional jazzy Sunday afternoon slots at Hoochie are rapidly approaching legendary status. Jason Isaacs Big Band, the Strictly Smokin' Big Band and Gerry Richardson's Big Idea are, themselves, already legends in their own right and the audiences are fully aware of this. 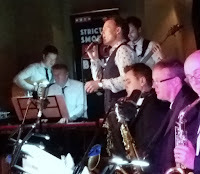 Last Sunday, Hoochie was packed out for SSBB - a gig that had the added incentive of featured guest Joe Stilgoe. This coming Sunday, Gerry Richardson's Big Idea return with an even bigger incentive - it's FREE! Bebop Spoken Here’s regular contributor Ken Drew (words and photography) has had his eye on the BSH hit counter. It has now clocked up a clicktastic (Ken’s term!) THREE MILLION hits!!! Ken suggested that this milestone should not go without comment. 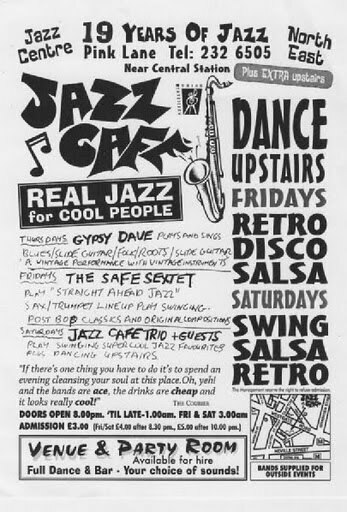 Lance Liddle, BSH Editor in Chief, musician (retired) and lifelong jazz fan had the idea of putting a few thoughts online about the local (north east of England) jazz scene, perhaps wondering if anyone would read, let alone respond to, them. 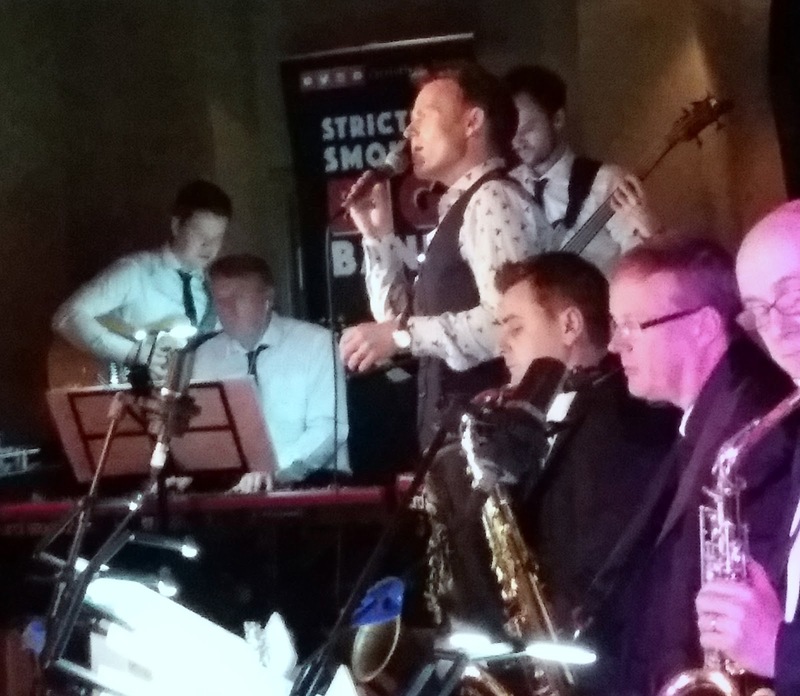 The Strictly Smokin’ Big Band at Hoochie Coochie is a guarantee of top quality entertainment. Add a ‘big name’ guest to the event and you’ve got the makings of a memorable occasion. 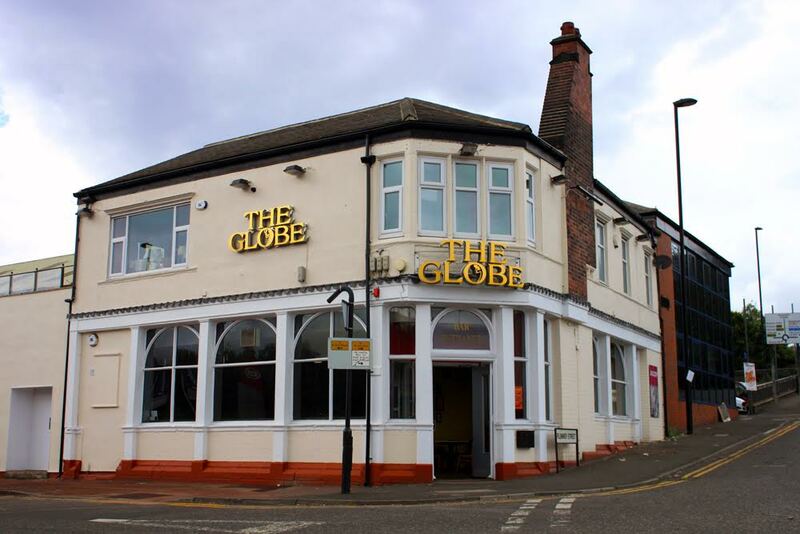 This Sunday afternoon gig - doors four o’clock, band on stage five thirty - attracted a large crowd, many of whom know a good thing when they hear it. Michael Lamb’s dynamic big band knocks spots off most with its ensemble work, the sections packed with accomplished soloists and the cherry on the top in the form of vocalists Alice Grace and F’reez. The bonus on this gig? 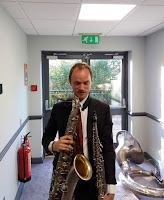 Due to the standard of the Strictly Smokin’ Big Band’s musicianship, it was possible to secure the services of a musician of the calibre of Mr Joe Stilgoe. Lounge suits the order of the day, the Strictly Smokin’ roared into action with Mexicali Nose. Buddy Rich’s Big Swing Face album continues to provide rich pickings (no pun intended) for the big bands of today and the guys in the SSBB helped themselves. Vocalist F’reez turned up the heat on Julian ‘Cannonball’ Adderley’s Things Are Getting Better with MD Michael Lamb leading from the front. Lullaby Of Birdland; and That Old Devil Called Love. All this is sung to the accompaniment of the superb Alan Law on piano. The singers are Jen Errington, Jenny Lingham, Carrie McKullock, Miriam McCormick and David Edgar. Five individual voices interpreting songs which are well worth listening to. Admission is £5, well worth the price, and proceedings begin at 7.30pm. I’ll be there so I hope that YOU are there as well! Lunchtime Saturday, the rain just about holding off on the second day of the inaugural Maltings’ ‘Jazz Weekend’. 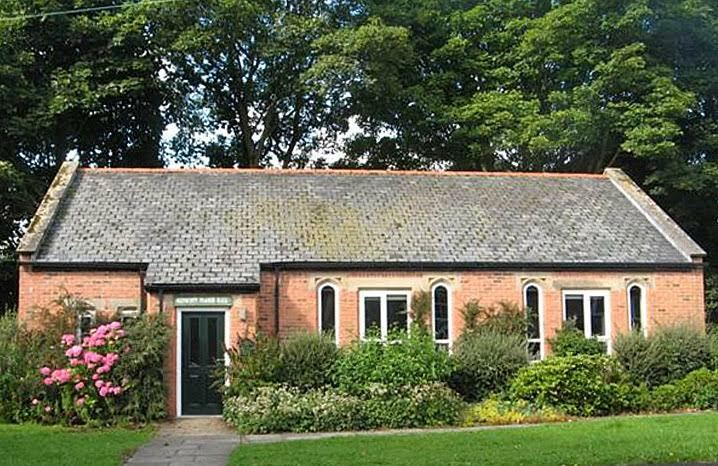 Berwick upon Tweed bustled as tourists mingled with locals out shopping, bed and breakfasts advertising ‘no vacancies’, the YHA on Dewar’s Lane doing good business. At two o’clock a near capacity Henry Travers Studio audience set off on a whirlwind tour of jazz piano from A to Z through one hundred years and more of the recorded history of the music. An almost impossible task, but if anyone could do it, Geoff Eales was the man. Billed simply as ‘The History of Jazz Piano’ Eales adopted the maxim ‘If it ain’t broke, don’t fix it’. From Scott Joplin to Geoff Eales, and several superstar pianists in between, the chronology was laid out before us. Ragtime Scott Joplin – Maple Leaf Rag, The Entertainer – played by Geoff Eales at the Maltings’ Steinway piano – not a bad way to spend a Saturday afternoon! 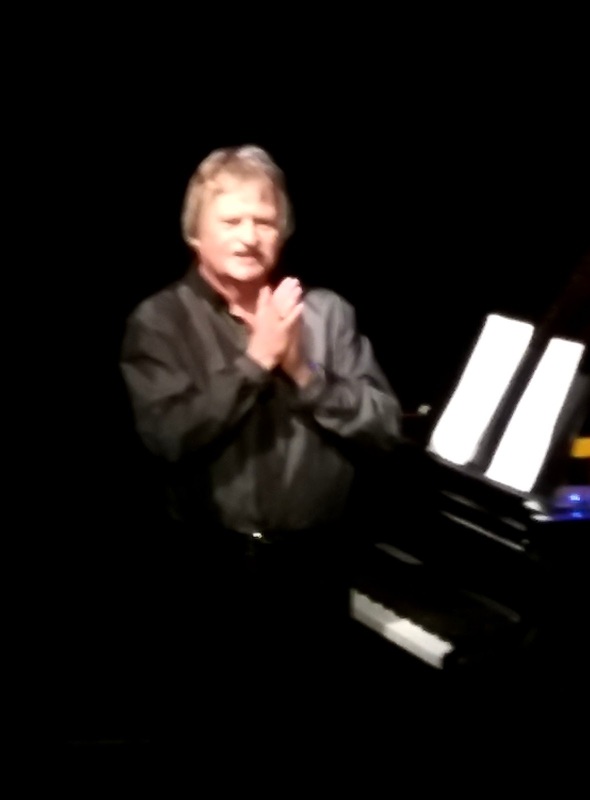 Eales introduced each piece to, one suspects, an audience more than familiar with both pianists and tunes performed. Jelly Roll Morton (Eales) playing Maple Leaf Rag demonstrated the new thing – ‘swing’. 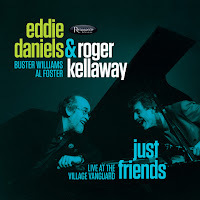 It was clear to all that Eales had the history of jazz piano literally at his fingertips. CD Review: Joy Ellis - Life on Land. Classic Swing @ Ashington Jazz Club. A Double Century This Weekend!